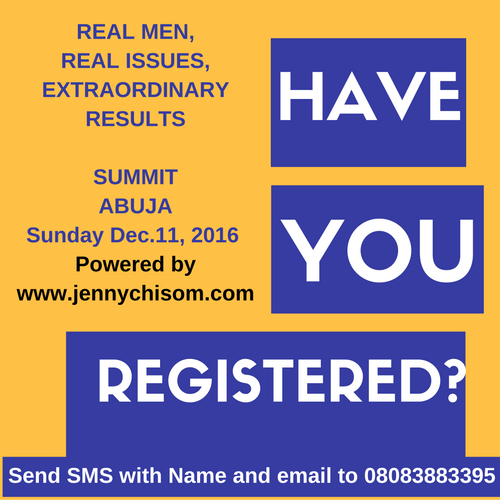 I'm so happy we are just 5 days away from our first MEN ONLY summit in Abuja tagged "Real men, Real Issues, Extraordinary Results which is scheduled for Dec. 11, 2016 by 4pm. It will feature experience sharing, panels discussions, teachings and talks, Bare-it-all questions and answer sessions and refreshments too. Members of the League of Extraordinary Men on Facebook has been really instrumental to making this happen, and I am really happily overwhelmed with working with men. What started off as an idea is becoming a big deal and yes oooo, the men are so excited too. If you know a man you love who lives in Abuja, Nigeria, encourage him to register today either via the SMS format (above) or via this link here . I will be back with more update later. And yes please share this blog link to benefit a man.